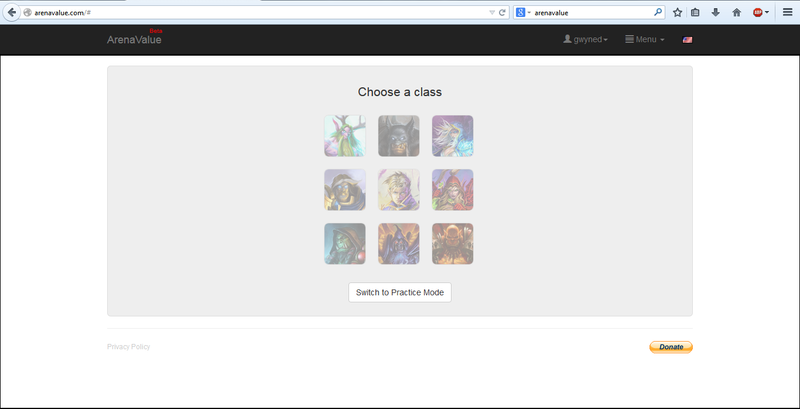 Today I want to share with you a great freeware program for Hearthstone called ArenaValue. 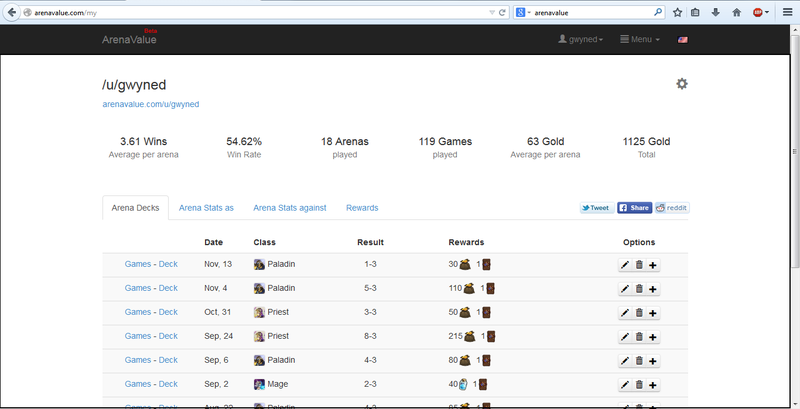 ArenaValue is a program designed to help you improve your results in Arena mode. It provides tools both to draft better cards and to track your results over time. Let's talk about both of these modes. One of the best features of drafting in Hearthstone is the fact that it's asynchronous - meaning that it's not dependent on other people drafting at the same time. As a result, you have an unlimited time to make each draft pick. 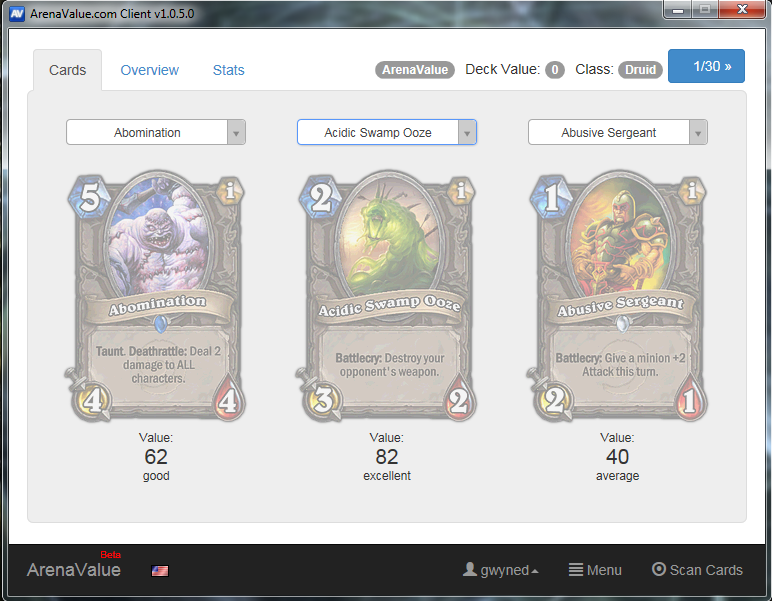 ArenaValue actually takes a screencap for each pick, and then assigns a numerical value to each card you could pick based upon not only overall power level, but also mana curve and whether or not the card is good in multiples. Even better, you can actually go into their database for every card and see how often winning players select a particular card over any other card. Further, the program also provides links to the pick-orders of three different Hearthstone pros to provide multiple opinions on your pick. Once you have finished your draft, you have the option of saving it to your online profile. This not only allows you to go back and analyze every pick you made in the draft, but also allows you to track exactly how the deck you drafted performed. As you play out your matches, you can record whether you went first or last, whether you won or lost, and which hero you played against. And when your draft is over, you can then record exactly which rewards you received (which varies somewhat even for the exact same results). Over time, you can analyze all sorts of information from your profile, like which hero type you do best with, your average return on investment, and even how many wins or gold you've accumulated over the life of your drafts. I highly recommend this program if you spend any time at all playing Arena on Hearthstone. It's an invaluable teaching tool, tracker, and database. It's easy to use, reliable, and while not perfect, is very good. The author is also continuing to work and refine it, with new features coming down the pipe. Give it a try - you won't be disappointed!